On the first day of summer (at least according to the calendar), a Sister was going for a walk in our garden at mid-day. 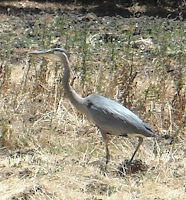 Walking along the Rosary path under the acacia trees and looking across an empty field, she thought she saw a very large bird. It seemed to have a long neck, a small head, a large body, and rather long legs. 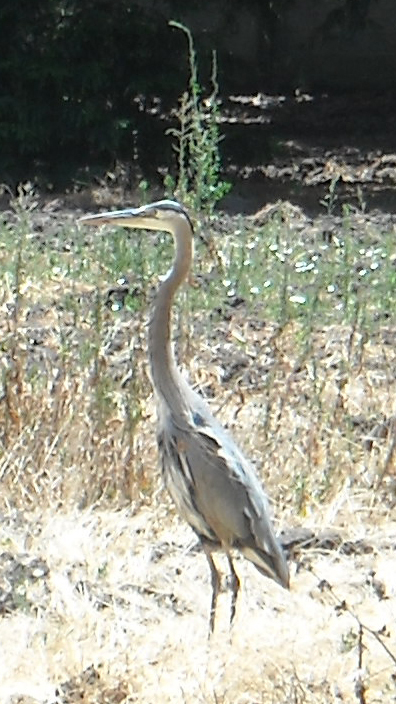 She watched for a while as it seemed to stand rather still with only its feathers moving in the slight breeze. Since the "thing" didn’t really appear to move, she finally convinced herself that she was seeing the top of a water faucet (which stands about 2 feet above the ground), with a bunch of dry weeds below it. So she moved on intent on getting back to the house in time for the next exercise. But as she rounded the path and circled back in the other direction, the ‘water faucet’ moved. And then the ‘pipe’ on which it was fastened bent down to the ground and back up again. She rushed back to the house and summoned another Sister with a camera, which proved that this was not just a warm day’s hazy vision. 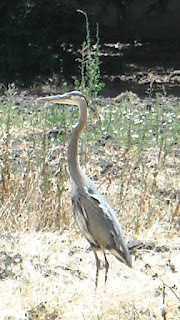 It turned out to be a beautiful Blue Heron who probably considered our garden to be a rest stop on his way to the pond at the nearby Civic Center. Another unexpected visitor in our enclosed cloister garden was a little squirrel who somehow got over the roof and down into the garden which is enclosed by four wings of the building. The poor little thing was scared and could not figure how to get back out to the trees he loves. 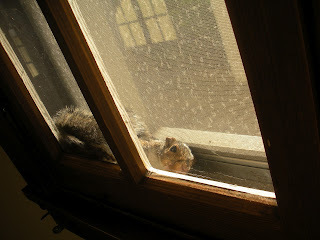 He would work his way between the window and the screen, probably hoping to get through the window, but that would only lead him into the house. So we put out a squirrel cage, bated it with a peanut butter sandwich and some nuts, and left him in peace to find the food. It did not take long, and soon he was sitting on top of the cage trying to figure how to get in to the food. Before long the smart little guy found the door to the cage, went in to have lunch and the door closed behind him. Then we took him out to the big open garden and set him free. He was delighted with his relocation and immediately ran up one of the big oak trees to have a happy reunion with his family.